It’s time for a small update of GPU Shark with the support of upcoming Cayman-based Radeon HD 6970 and HD 6950 (see some details here). 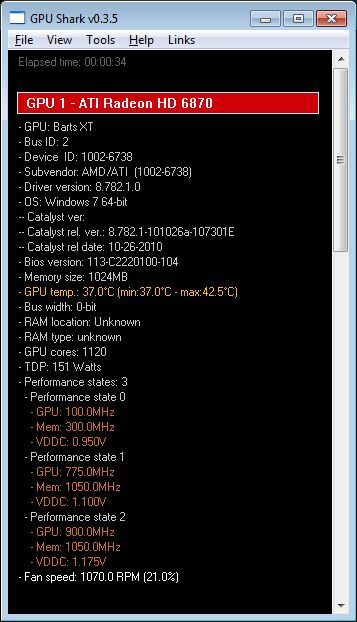 GPU Shark is a simple, lightweight (200KB) and free GPU monitoring tool, based on ZoomGPU, for GeForce and Radeon based graphics cards and is available for Windows only. GPU Shark offers a global view of all your graphics cards in a single window. More information HERE. New: added support of Radeon HD 6970 and Radeon HD 6950. 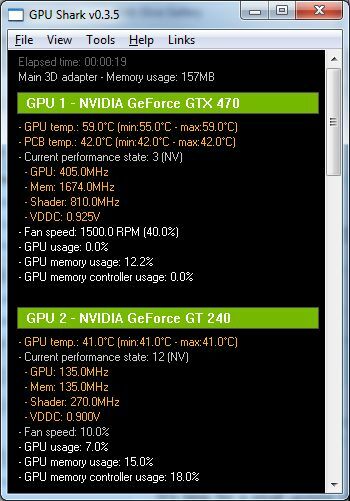 New: added support of GeForce GTX 570. Change: in font and background color. that color scheme is perfect!